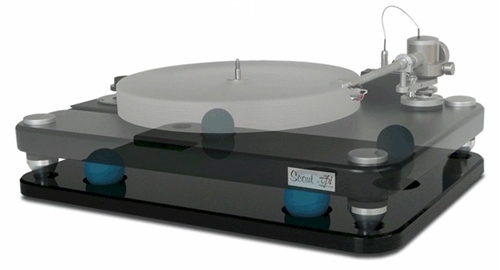 The Cloud 9S is designed specifically for the popular VPI Scout/Scoutmaster. It has several attractive features: It features the double thickness base of the Cloud 11 for high performance and safety (the balls won't roll off the dimples) It features a separate plate for the motor, further isolating motor noise from the plinth. It provides dimples placed strategically to allow many ball position combinations to accommodate different weights from the Scout to the Scoutmaster with Super Platter. The balls support the bottom side of the plinth for a lower profile. The silver cone feet will go through the four corner holes and be lifted off of the shelf, further isolating the plinth from shelf vibration. It follows the contour of the Scout/Scoutmaster plinth and is a perfect match visually.